HP has announced a new touch-screen tablet PC aimed at consumers. The Pavilion tx1000 runs Windows Vista Home Premium which has Tablet PC capabilities built-in. The company is trying to pitch the new 12.1-inch model at media-savvy consumers who also use their notebook to watch video content as well as using the device like a traditional laptop, perhaps in a workplace. The screen features HP's BrightView technology, designed for crisp content playback. Under the hood, the laptop is powered by an AMD Turion 64 X2 and has up to 160GB in storage. There's also a 1.3-megapixel webcam as well as a removable DVD drive. It sports HP's Imprint case design too - this is a hard, high-gloss coat, designed to minimise scratching. 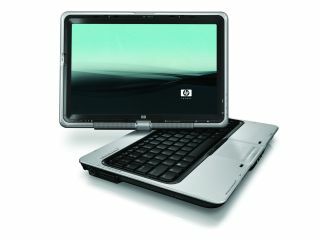 HP has pedigree in the tablet space, and is one of the only manufacturers to persevere with the technology, which has been improved in Windows Vista. Until now, HP has never aimed its tablet-efforts at general laptop buyers. The Pavilion tx1000 is available from PC World for £899.